JOURNEY Paddleboard & Paddle | Color: Everglade | Length: 10'6" | FREE SHIPPING! 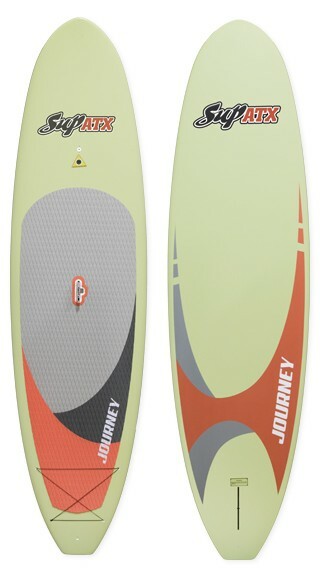 JOURNEY Paddleboard | Color: Everglade | Length: 10'6" | FREE SHIPPING! 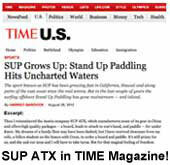 The SUP ATX "Journey" is a performance-designed, all-around eps/epoxy construction paddle board for all types of stand up paddling including lakes (flat water), ocean surfing and even boat wake surfing for any size paddler weighing up to 250 lbs. 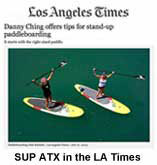 Journey model paddle boards include the most popular features of boards selling for over twice the price including, 1) a patented LiftSUP retractable handle for easy carrying and locking, 2) an integrated ConnexSUP mount on the nose (ie: for attaching accessories sold separately such as a GoPro camera, waterproof speaker, waterproof box, etc), 3) integrated bungee tie-down plugs on the tail (bungee cord not included) for taking extra cargo on board (ie: cooler, waterproof backpack etc), 4) a durable EVA/Memory Foam deck pad that keeps feet and legs comfortable while increasing stamina, AND 5) THIS PACKAGE INCLUDES an integrated automatic vent plug, integrated leash plug and fin. 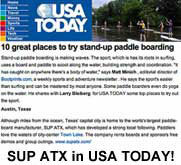 Without question, this is the best deal ever offered by any company in the paddle board industry. #1 in Quality, Value & Customer Service. 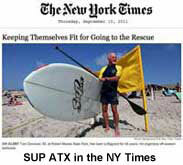 No Sales Tax except CA & TX.